Below you will find our guidelines and some examples for your reference. If you have specific questions please call the office or talk with your driver. We only pickup up natural yard waste, including grass, leaves, tree limbs, flowers, garden plants, walnuts, apples, Christmas trees, etc..We cannot pickup any trash or construction materials. If bags contain trash or foreign material they will be left at the curb. Any plastic bags inside other bags will be considered trash and will not be picked up. We do not collect animal waste, fireplace ash, or lumber. Always have your bags at the curb by 7:00 a.m. on your designated pickup day. Depending on the volume and number of trucks on the route, your pickup time will vary weekly. Bags are not intentionally missed, so please contact the office before bringing them back as the driver could be running late. Drivers work until their routes are done, so don’t pull your bags back because he is running later than normal. Maximum item weight is 50 pounds. Maximum bag size is 39 gallon. All bags must be securely closed. Small cardboard boxes may be used provided they are no larger than the size and weight limits. We suggest five gallon buckets or small boxes for fruits, small brush, wood or items that would easily break a bag during removal. Please use paper bags or boxes for tree limbs, not plastic bags. It’s as hard for us to get them out of the plastic bag as it is for you to put them in. Brush must be tied into bundles of 18″ x 36″ long or placed in a paper bag or cardboard box. Tie bundles securely with rope or twine – NOT wire. Maximum log size is 6″ diameter. Christmas trees are the only items that do not require bundling. If your tree is over 6′ in length please cut in half and remove any ornaments and plastic bags. Each bundle is considered one of your items for pickup. Please do not put brush or sticks in plastic bags. Yard waste bags need to be directly at the curb in front of your home. Compost Connection will not enter your yard to pickup bags. If you are placing your bags in another location due to living on a corner etc., please contact the office so we can mark a note on your route sheet. 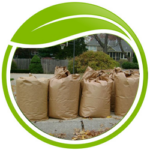 Please separate yard waste bags from regular house trash so we can determine which bags are intended for us. Compost Connection will not go behind cars, or into or behind bushes to look or pickup bags for pickup. All bags need to be visible from the street for our driver to stop. Your pickup day is located on the address label of the envelope your information came in. Contact the office if you cannot find the envelope. 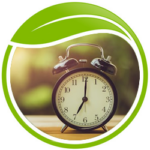 How long is my contract with Compost Connection? Your contract starts on the day we receive payment and continues for one year. What if I want to refer my friend? We offer a free month of service to extend your service for each friend that you refer. You can use our flyer to put your name and address on and then give to a friend. You can also just have them mention your name when they call in their order. Thank you for choosing Compost Connection and we appreciate your referrals. Can I share my service with a neighbor or relative? NO. Sharing is not allowed on our programs. Program pricing is based on one household use over the course of the year. If we believe you are sharing the program your service will be cancelled and no refund issued. Please use Paper bags. All brush must be bundled in 18″ x 36″ bundles and tied with rope or twine or you can use a small card board box or paper bag. We recommend the paper lawn waste bags sold at your local hardware store. They can be folded over at the top of taped with PAPER tape, not duct tape. While the bags hold up very well, be careful when dragging if the bottoms are wet. What is the weight limit per bag or bundle? There is a 50-pound weight limit on bags or bundles. Why did my yard waste did not get picked up? 1. Were the bags out by 7:00 a.m.? 2. Are the bags at the curb? Were they blocked by any cars or bushes etc.? 3. Can they easily be seen from either direction? 4. Do the bags contain any items that are not considered yard waste? 5. Are the bags less than 50 pounds? 6. Are you over your weekly limit? What do I do with sticks and tree limbs? 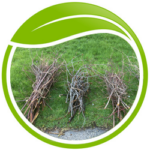 Sticks and tree limbs can be bundled in 18″ x 36″ bundles and tied with rope or twine OR you can put them in a paper bag or small cardboard box. Each bag or bundle is considered one item towards your annual pickup. Sticks may not be placed in plastic bags. You missed my yard waste, what do I do now? The drivers do not intentionally miss bags so we do not know unless you alert us. We will mark the route sheet to take double limit the following week. You can notify the office via phone or you can send an email. How do I keep my paper bags from falling apart in the rain? To protect your paper bags store them in a dry place until the day of pickup and limit the amount of yard waste in the bag if the contents are moist. Usually bags will not fall apart while waiting to get picked up, but if you are concerned, you can place your paper bag inside a plastic bag as long as the driver can still see that there is a paper bag inside. If you know the program that you would like to change to you can mail in a check or you can contact the office to charge on a credit card. If you need more information before you decide you can contact our office or refer to our Programs Page or How to Order page for more info. Your service is paid annually. If you want to upgrade during the year it is possible to upgrade. However, we cannot downgrade to another program or cancel your service until your year ends. How do I get more Over Limit stickers? You can order stickers by mailing in a check for $10.00 to get 10 stickers. Do not order too many as Over Limit stickers are only good when you are on the Annual Program and are not refundable. Mini programs are limited to 1 set of stickers per year. Do my Over Limit stickers expire? Over limit stickers do not expire. However, your account must be current in order to use your over limit stickers. We will not pick up bags at an expired address, even with the over limit stickers. I am an Annual Customer and I have more bags than allowed? If you want all of the bags to be picked up at one time you can contact our office and purchase Over limit Stickers to be placed on any bags over your limit. These stickers are only good while you are an annual customer. You may also pay the driver $1.00 for each item over your limit. You must leave a note on your bags asking him to come to door for payment taped to the door. The only exception to this is on the MINI program. Your are only allowed 10 over limit stickers or payments per year. If you need more you can use our Standard Program. I forgot to put my yard waste out on my schedule day. Will you come back to pick it up? Unfortunately, we cannot do this, because of our busy schedule we cannot come back to a stop from a previous day or for bags that were put out late. I am going out of town for several weeks. Will I receive credit for these weeks? 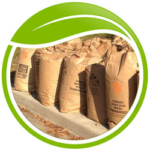 Our yard waste programs are so affordable because it is based on a full year of service, we are not able to credit for vacation holds. No, our programs are non-refundable. 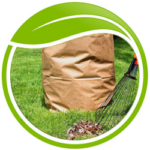 Does your company take large amounts of yard waste? Unfortunately, we are not a tree service so we cannot pick up entire trees or bundles larger than 18×36 inches. Individual limb diameters should be no larger than 4 inches inside the bundle. At Christmas time, we do pick up Christmas trees. However, if the tree is over 6 ft we ask that you please cut it in half. Our trucks do not allow for us to pick up items any larger than those stated in the guidelines.